Pro: Emotional Medicine Rx: Cry When You’re Sad, Stop When You’re Done, Feel Good Fast speaks to body-wisdom that has been long missing from the personal development field. Andrade takes us out of our heads and into our bodies to discover what we need to emotionally heal and remain present with life. 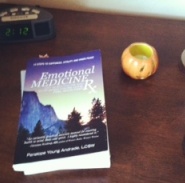 Con: While the book centers on the single “Emotional Medicine” technique, there are many facets and helpful ah-ha’s along the way which have the potential to become overwhelming. I urge readers to select one chapter or aspect of the book to concentrate on at a time. Build your tool belt slowly and with repeated experimentation. Learn more about the author, Penelope Young Andrade, LCSW, in this insightful interview. The “positive thinking movement” has brought us into our thoughts. We watch them, focus them, attempt to control them, feel guilty or frustrated with them and struggle to point them toward a brighter tomorrow. All of this activity happens above the neck. We’ve become psychoanalysis, picking apart our minds in attempt to understand why we feel the way we do and discover how to feel better. We are missing 80% of our body which resides below the neck that actually has some profound insights. It turns out that your body knows what you need. It knows how you feel and reflects that to you in pain, pleasure, and a variety of other sensations. If you took a moment to be still and ask your body what you need, you would be astounded to learn that you can be guided to move through pain quickly to get to better feelings on the other side, without any psychoanalysis required. Andrade’s book is a guide to walk you through the process of moving into your body and emotions to really hear what it is you need to achieve balance and positive feelings. Though you may need to process some painful emotions, which might include tears, as part of your personal Emotional Medicine you will find that your body works through discomfort very quickly, around three minutes, when given the “okay” to do so. The book includes lots of anecdotes from Andrade’s personal life as well as examples from her work with clients. It is a book about getting to know yourself in a very intimate way so that you can use your own wisdom to guide yourself toward better decisions, new directions and the warmth of spiritual connection. Andrade helps demystify the myriad of sensations we have in our bodies to better understand what we are trying to communicate to ourselves. The book is well researched and organized to allow you to move at your own pace toward a new relationship with yourself. After receiving some troubling health news earlier this week, I took a bit of Emotional Medicine myself. It was surprised to find that what could have been hours of upset and worry was only a few moments of tears because I was present with my body and the emotions that were coming up. My body didn’t need me to feed my tears with worrisome thoughts; it just needed to be acknowledged that I felt sad, once that was done, I felt calm, resourceful and centered. If you find yourself stuck in confusion, negativity or even feeling numb, I highly recommend you turn your attention toward your body and pick up a copy of Emotional Medicine.